Mercedes-Benz Malaysia has officially introduced the locally-assembled W212 Mercedes-Benz E300 BlueTEC Hybrid – the car, the first diesel hybrid to be commercially available in the country (and the company’s second CKD hybrid, after the S 400 L Hybrid), was actually previewed to the motoring press in December last year, but pricing had at that point not been finalised. It has now – the RM348,888 price tag isn’t very far away from that initially suggested by an ad that popped up last August on our sister site oto.my. Upon first glance, the pricing may not jump out in a big way, but it is significant upon comparison. Thanks to excise duty exemptions for CKD hybrids (in place until Dec 31 this year), the locally-assembled E 300 BlueTEC Hybrid is actually cheaper than the previous baseline E-Class facelift model, the RM367k E 200, undercutting the latter by RM18k. The hybrid’s introduction effectively makes it the most affordable E variant in Malaysia. It may be the cheapest, but it’s very well specified – in fact, it has pretty much the same kit as the CKD E 400, which was introduced last November. The E 300 BlueTEC Hybrid gets the AMG Sports package (AMG bodykit, velour floor mat, twin exhaust system with bumper-integrated rectangular stainless steel pipe ends) as well as the same 18-inch twin five-spoke alloys seen on the latter. The Malaysian car also comes equipped with LED headlights and Intelligent Headlight Control Plus. Other equipment from the E 400 includes the rear seat entertainment system – which features two display monitors integrated into the front seat headrests – and surround view camera. Like the E 400, the E 300 BlueTEC Hybrid is available with a number of interior colour schemes. The E 300 BlueTEC Hybrid is powered by a 2.1 litre turbodiesel and electric motor combination – the OM651 DE 22 LA four-cylinder unit is good for 201 hp at 4,200 rpm and 500 Nm from 1,600 to 1,800 rpm, while the three-phase AC internal rotor magneto electric motor (which is installed in the clutch housing between the engine and the transmission to save space) offers 20 kW (27 hp) at 1,800 rpm and 250 Nm at an operating voltage of 120 volts. Power is put to the wheels by a 7G-Tronic transmission, and performance figures include a 0-100 km/h time of 7.1 seconds and a 242 km/h top speed, while fuel consumption is rated at 4.1 litres/100 km. The frugality of the car was exemplified by the fuel economy challenge it undertook last year, in which Brit motoring journo Andrew Frankel managed to drive 1,968 km from Africa to the UK on a single tank of diesel. Speaking of the lithium-ion battery, the compact unit has an energy content of 0.8 kWh and an output of 19 kW – on a full charge, the car can cover about a kilometre on electric power alone, at speeds of up to 35 km/h. It not only stores energy for the electric motor, but is also connected to the 12-volt vehicle electrical system via the DC transformer to supply power to items such as the headlamps and comfort features. Because of its size, it’s able to be placed within the engine bay, right behind the front left suspension turret. It’s always located on the passenger side, so in left-hand drive E 300 BlueTEC Hybrids it’ll sit behind the front right suspension mount turret (and the other way round for RHD). The system consists of the cell block with its lithium-ion cells and the cell monitoring system, the battery management function, high-strength housing, cooling gel, cooling plate, coolant feed and the high-voltage connector. The unit is cooled by refrigerant similiar to that of the air-conditioning system, but runs off a separate circuit from the car’s AC. An electrically-driven air-con compressor means that in stop-start traffic, the vehicle can also manage on battery, and it isn’t until the battery levels run down to around 36% that the engine restarts. The E 300 BlueTEC Hybrid doesn’t come with a spare tyre, and a regular 12-volt battery is located beneath the luggage compartment to support cold starting and act as a buffer store for the on-board electrical system, and there’s an additional small backup battery to prevent unpleasant flickering of the vehicle lighting and dropouts in the infotainment system in start/stop mode. 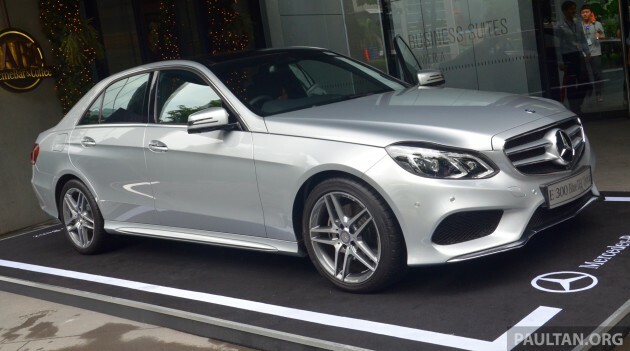 Also, the Malaysian E 300 BlueTEC Hybrid is unique, in that it runs a specially-adapted Euro 2M engine, with changes related to the emissions system (the particulate filter has been removed, and a water separator added). Mercedes-Benz Malaysia added during the presentation that no other markets that sell the car have this configuration, making it specific to Malaysia – the homologation papers even reflect this, and the company says that it’s impressive that Daimler AG has done this for our market. The unit can of course run Euro 5-grade diesel, which is currently available in Johor – MBM says that the diesel mill is up to the task of running Euro 2M, having conducted field evaluations here over the last five years with random fuel sampling as well with a fleet of locally-assembled W204 C 220 CDIs, which ran durability trials over a cumulative 400,000 km without a hitch. From an E-Class buyer’s perspective, the E 300 BlueTEC Hybrid is certainly a lot of car for the money – kit-wise, you’re getting most of what’s on the E 400, and you fork out less than that needed for an E 200. Not quite the level of that achieved by the insanely-priced S 400 L Hybrid (and Audi A6 Hybrid), but the proposition is no less compelling. For a more detailed look at the new model’s specifications, refer to CarBase.my, where you can compare the E 300 BlueTEC Hybrid against the rest of the W212 model range. Or better yet, see how it fares next to the similarly-priced BMW 520d to see what a real bargain this is. Jangan tipu!! ini clear stock tektik!! new model akan keluar, nak tipu Pak Cik tua kah?? Come to think about it, Merc really try to corner us. Mercedes Diesel Hybrid also out (somemore CKD), still Proton Hybrid no news! See the difference between do-the-work and makan-gaji-kosong?! Is Proton developing a hybrid which can be used on earth and Mars? Dirty diesel is causing a lot of health problems for every Malaysian. The fumes are choking us and actually killing the elderly people. Clean Euro 5 diesel should be given immediately and on the spot to all pumps. All our Asian neighbours have clean diesel except us. All because Government owns the National Oil company and Government don’t want their Petronas to invest in cleaner diesel but rather see Malaysians die of lung cancer and throat cancer. All the bus companies and lorry companies that smoke us with thick black smoke also are owned by the BN Ministers through various proxies. In Malaysia now, respitory illness is the No 2 killer. But Government don’t care. Let the 30 million people die, so long as we BN guys can enrich ourselves with Petronas money. But the Government people are so stupid. The Government hospitals will bear the burden and cost of the many people with respitory illnesses and asthma, lung infection, cancer of lungs and so on. Ask the European Union, sulphur and other hazardous materials in Euro 2 filthy diesel is so toxic and cancerous to society, it is the biggest ever crime that can be committed to society by a Government. The microscopic hazard that enter your lungs and eventually your bloodstream is so poisonous, it is as good as you drinking some Roundup everyday. After hearing this, I think I don’t trust Mercedes anymore. the real NUTELLA is here. The people of Malaysia should not beg for clean air. To breathe clean air, it is our right. All over the world, governments are moving to cleaner engines and fuel efficient engines to give their people cleaner air. In Malaysia, government blackmails us to get clean air. One day tax incentive is on for hybrid, then another day, tax incentive is off for hybrid. 10 years ago, told us clean diesel is on its way. Now 2020 comes, they will say 2025 or 2030. The Government of Malaysia blackmails its people for the right to breathe clean air. The whole purpose of a government is to look after the well being of its rakyat and provide the rakyat security. That is the definition of a government. A government collects taxes from the rakyat, in return, they provide a safe, secure country for its tax paying rakyat. In this case in Malaysia, Malaysians have been suffering with dirty fuel and higher emissions for over 15 years when all over the world they have upgraded their fuels to give their people cleaner air. They also promote cleaner hybrid engines to provide cleaner air and they give their rakyat cleaner petrol and diesels that emits very low Co2. Don’t talk about cars now. Lets talk about the health of a nation. Because of the dirty petrol and diesel and not promoting hybrid cars, the air pollution is so hazardous to the rakyat, it is the result of countless of cases of lung infection, cancer and respitory illnesses. All our hospitals are full daily mainly because of respitory illnesses. Older people suffer most because of polution by the low grade fuel given by our government. Have you seen your old mother and father pant and gasp for air? That is because the government of Malaysia has failed its rakyat giving them cleaner air to breathe. They don’t care for the 30 million people suffer and the environment. They want you to use more dirty petrol and fuel and pollute the environment. The Environment Ministry and the Minister has no balls. His job is to ensure a cleaner environment. All over the world, the oil companies are so scared of the governments and they comply with all the Euro5 regulations imposed by their caring governments. But not in Malaysia. Government does not care at all about the Environment at all. Besides Hybrids, government must ensure all companies come out with Hybrids to promote lesser emissions into the environment. The Government of Malaysia has failed its rakyat in giving a clean environment, safe and secure country for the rakyat to live in. The government takes the tax payers money in vain here. It is not doing it job. It is as bad as some African war torn country. Don’t be fooled just because Malaysia has no war and is supposedly peaceful. The dirty air and environment itself is war on your lungs and respitory system and this war is far worse than your physical war of guns, mortars and tanks. It is a silent killer. The dirty fumes emitted from vehicles because of the dirty fuel and non hybrid promotion kills more people per annum than any war will. Our government has time to play a chess game with people’s lives and health in Malaysia, gambling their lives away with their lalang attitude towards hybrid tax incentives. No more value does not use Malays to comment. Do some research before you pretend to be someone. Mercedes MY should ask Daimler AG to develop a petrol 2.0T combine with hybrid instead of the Diesel motor. Why put in so much of funny accessories ? Better put in thing like Adaptive Cruise Control lar…. Does the insurance premium go up after CKD hybrids incentives are over? Any Prius/PriusC/Audi A6 Hybrid owner care to share? Now RM343k, later no incentive become RM500k+ insurance cover. Good info for potential City Hybrid buyers too. City is much better. sportier dashboard and interior. He’s been doing this for quite some time now….. poor fella…. pray for him ya….. otak dia kurang skit…. Hey, I’m your mental doctor, you forget to take medicine today. People that planned to buy a luxury car won’t go to buy a City because of your comment. Because City is too mainstream. The same Matrix from Lowyat FnF ?! Go back to your Proton forum lar, you can’t afford then go come and spread poison everywhere. Do something more constructive with your potong forum. Thank you ! Don’t be stupid la you. I have sold my old savvy. Currently i am driving city and inspira. Also, savvy RV is better than merz. wow! Which sorhai dealer you sell to? thats the best you can come up with? go study hard or go back to work la… you need to put more effort into your work. while i’m driving the new e300, good price actually. my shophouse can actually pay the installment. lol. hope everyone finds this inspiring, if not… then haters gonna hate. for those that understand what i mean, good luck. Can MBM bring in C class diesel or C class hybrid at price cheaper than C200? better ask proton to rebadge this.. u might just get to have it for a cheaper price.. after all proton is the master of rebadging.. here in bolehland.. I think this E300 Bluetech will be sold out in few days.. If you can afford a 350k car then you should be taxed. People who bought a vios paid more tax. Something not right with this policy. can u pls giv d exact figure by how much r Vios owners being taxed? Since Vios has so many variants. I just take the highest end variant TRD Sportivo and give you the figure. It is RM22,027.64 . How to obtain this figure ? Peninsular Malaysia price minus tax-free Langkawi price. Godcar owners must be proud they’re more patriotic than Merc owner. And Godcar best RV, so jangan persoal. We all shouldnt be taxed heavily regardless u drive a cheapo vios or luxury Bentley. Taxed appropriately and let the market be competitive. Not just protect and only those few who are well-connected can afford luxury cars. The guy below seems to confirm Camry hybrid is coming. If u think MBM being shrewd, wait until UMW teach MBM a lesson in being shrewd. Who dare bet UMW won’t be an arse with the Camry hybrid pricing? Best of all, there will be plenty suckers gonna willingly slaughtered by UMW. Looking forward to Camry Hybrid. Just saw them filming commercial in Putrajaya last Sunday. Much nicer than the current Camry. No point launching such models unless you have enough cars to sell. They stopped taking orders for the S400H just after a few weeks after launching it. Ridiculous. Because it is fully booked. went to MB showroom and they said if I want an S-class, i have to wait till 2016. N price at RM900k. SA told me its better to get S500 if price wasnt an issue. this car sure will be selling like a hot cake in johor. Deyy len chai matrix…lu tatau apa2 tutup lu punya mulut lu punya jari kasi gigit lu punya gigi kasi kutip. Bolo ponya olang. while i am not a w212 fan, i have to credit to mercedes for bringing in the AMG version. Most older buyers will probably not buy a diesel powered vehicle. By bringing in the AMG spec model, it may entice younger buyers who are more open to change. i personally prefer the F10, but the w212 AMG looks good. I just don’t like Command (prefer iDrive) and the rear design of the car. The steering wheel design is damn nice though. And MBM didn’t slashed kits despite lowering the price. If it were you-and-da-view …. Brace yourselves, queues are gonna start infront of MBM showrooms. 500Nm. Now that is impressive. MBM could have sold it at a cheaper price but they didn’t and they will expect it to sell like hot cakes like how the S400 was sold out quickly. But this model here ain’t new – the interior is for people who are well in their 40’s and the design is no where near the S and C Class which are a generation ahead. But since its still cheaper than the E200, I guess MBM could get away with it but IMHO this could have been sold RM20k cheaper. MBM is smart enough not to cannibalize the exorbitantly priced C250 by bringing a low cost basic E300 Bluetec…by kitting it like this and still keeping it below E200, it’s a sure fire thingy….queues are gonna form..
Buy S-class, then S400h come out duty free. 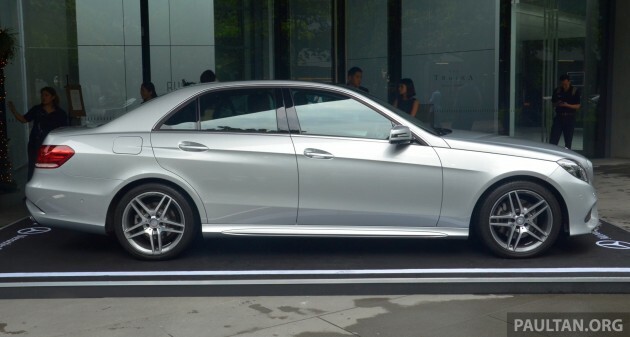 Harve buy E-class, now this come out. LOLOL. Sorry Paul and Harve! wow harvinder upgrades his 320d to an E-class? Having owned both. I believe Audi quality is way better than Merc. Merc esp th enew C class has improved a lot but not Audi standard yet….you forgot one more factor – the every important after sales service. Merc (Hup Seng) is way better than Euromobil and Merc comes with 4 years manufacturer’s warranty. Until Audi becomes a principal company here (I heard its already happening), I would go for the Merc. Thats a pretty good deal. But resale value (if anybody who can afford an RM349k car wishes to consider it) would not be as good as the petrol E Class. Because I doubt many would want to buy a 2nd hand diesel hybrid (they’d prefer the E200 or E250) due to the extra maintenance required for maintaining an electric power system. So, you win when buying it new, but lose out when it comes time to sell it. But its still a pretty good deal if you want to drive in total luxury at a “bargain”. Now when is that new E Class coming. Wife….you mean those bintang palace by hours? Yes. Please continue dreaming while driving your kenari. I saw you and Sam Loo at Toyota showroom do nothing since sales is bad, why dont consider to be proton sales man since Iriz sales is better. I propose you to stick to your Maserati toy at your cabinet lah. Jangan mimpi. Based on your lengthy explanation that your wife needs to do this and that and you have 4 maids to consider, suggest your wife gets a bus. Understand Rapid Bus is selling off some of their buses, you may get a good buy and show off to your affluent neighbors, you have the biggest motor vehicle around the neighborhood something you will be definitely be proud of. Better sell your junk kenari and get a kapcai for your wife. Pity her taking bus to pasar everyday to cook for ungrateful feller like you. i say i could drive your wife to the grocers, anywhere she want. i could even bang her for you for free. your welcome bro. but i hope she doesent look like a certain rosmah, u know. “Hybrid” stepping stone to an all “electric” car. Can someone be kind enough to keep me (and those interested) … WHAT IS THE COST OF A HYBRID BATTERY AND WHAT IS IT’S “BATTERY LIFE”? Tqvm you kind soul. May Allah swt (God) bless you. Don’t buy. New model coming out soon and this model would depreciate very fast! Any idea when the new model is coming out? The present model was facelift in 2013 and the earliest the replacement or new model will be 2016. Do you think the replacement model will be launched in 2015? NO TAXES for better technology/efficiency is fine but what even better is lower car prices, across the board, for better technology/efficiency. Taxes does not reflect or benefit the consumer in the progress made in auto technology. Taxes in fact distorts this progress with emphasis on pricing/marketing. This exact model in the U.K only cost £45,600(RM250,800) On The Road Price!! Here in Malaya, it’s CKD + Duty exempted cost RM349k, still RM100k more expensive!!! Please launch also C300 hybrid ! Why is it more expensive in comparison that the e400 in langkawi only cost RM 331,896.00 after full duty exemptions? want to know the lifespan of the E300 Bluetec hybrid Li-ion battery and how much to replace?